Warwick is a modern university, founded in 1965, but it has quickly developed an enviable international reputation for academic and research excellence, in addition to having connections with many world famous organisations, companies and institutions. It is a very realistic alternative to Oxford and Cambridge, and is one of only five UK universities to have always been ranked in the Top 10 in all rankings since they began (the other four are Cambridge, Oxford, Imperial and LSE). In The Times and Sunday Times Good University Guide 2018, it is ranked 9th overall in the UK and has consistently been in the Overall Top 10 every year before that. 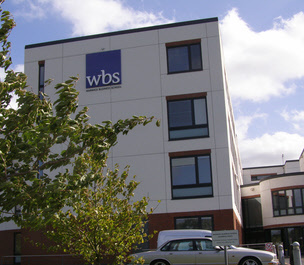 While Warwick Business School (WBS) leads the way with long established courses in Finance, Business, Management, Accounting, Marketing and Human Resource Management, the much acclaimed WMG department has become an industry leader and innovator with courses such as Engineering Business Management, Supply Chain & Logistics Management, International Trade, Strategy & Operations, Management for Business Excellence, Cyber Security & Management, Innovation & Entrepreneurship, Service Management & Design, Sustainable Automotive Engineering and Healthcare Operational Management. Warwick’s reputation is further enhanced by its expertise in Big Data, Chemistry, Life Sciences, Law, Politics & International Studies, Economics, Creative & Media, Physics, Education, Computer Science, Engineering and Philosophy, together with the finest facilities at the Science Park and Warwick Arts Centre. .
For aspiring UK undergraduates, Warwick also has one of the most prestigious Foundation courses in the UK, the Warwick International Foundation Programme (IFP), which is the ideal preparation for studying at Warwick (or other top UK universities). IFP students study and live on the Warwick campus, so when mixed in with degree students they immediately become a part of university life. 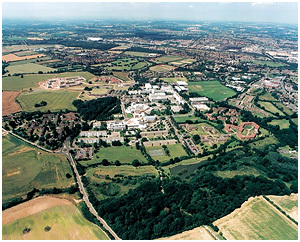 The University is located in a wonderful landscaped and very green and safe campus just a few minutes outside the thriving city of Coventry, in the heart of England, close to Shakespeare's Stratford-upon-Avon and the nice towns of Leamington Spa and Kenilworth. You can travel directly and easily to Coventry city centre by luxury coach from London Heathrow Airport and London Gatwick Airport using the excellent National Express www.nationalexpress.com. From Thailand, flying to Birmingham Airport (on Emirates via Dubai, Swiss via Zurich or KLM via Amsterdam) means you can easily take a taxi straight to the University of Warwick from the airport in about 15 minutes, so no need to carry your heavy baggage onto trains and buses at London Airport!!! Coventry is 60 minutes from London by fast train and it is also an ideal centre for travelling to other places in the UK and close to the National Exhibition Centre and the city of Birmingham, , famous for its shopping centres and markets. 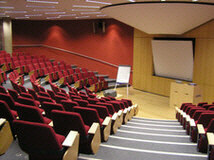 What attracts many students to Warwick is the wonderful and friendly campus environment and its fantastic facilities. These include the excellent University Library, the University Book & Gift shop, the Computing Service Centre, Warwick Arts Centre (one of the largest arts centres in the UK with 2 theatres, a cinema, a concert hall and a specialized music centre), the brand new Oculus Centre, the Rootes Building (with comfortable bars and restaurants and Costa Coffee to keep you awake! 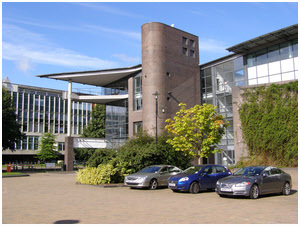 ), and University House (which includes the popular Learning Grid and the International Office). There are two banks (Barclays and Santander), plus a medical centre. If you don’t want to cook your own food, or if you wish to buy ready-to-eat meals and salads, the Rootes Grocery Store has a good variety (with a new in-store bakery too! ), and there is also a huge Tesco superstore near the campus which is open 24/7. There is also a Hair & Beauty Salon, a Post Office, a travel agency (STA) and a pharmacy. There really is everything you need, apart from a seaside beach!! 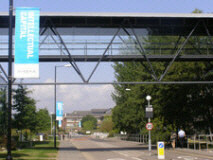 The Warwick Students’ Union is one of the largest and most active in the UK with over 300 societies to choose from – including a thriving and very active Thai Society at Warwick, who regularly organize special “Thai Nights”, which have become some of the most popular events at the University with other students. With the Thai Society, you are sure to have some friends around, and also likely to make more international friends who want to experience Thai cultural events. If you don’t want to cook your own food, or if you wish to buy ready-to-eat meals, the Costcutter supermarket has a good variety (with a new in-store bakery too! ), and there is also a huge Tesco superstore near the campus which is open 24/7. Sporting facilities are first-rate, with over 60 acres (that’s about 140 rai) of playing fields. There is also the famous “Bear Rock” climbing wall, a brand new fitness suite and aerobics studio with 100 state of the art pieces of equipment, plus an Olymprene running track for that daily early-morning jog before you attend lectures ……. !!! 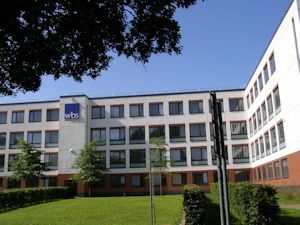 Warwick has some of the best and most modern accommodation at any UK university. 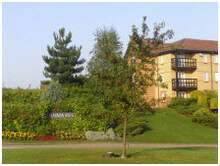 Many of the residences have landscaped views and with standards among the highest in the UK. The Benefactors, Heronbank, Lakeside and Sherbourne residences are situated near Warwick Business School around a picturesque lake, making for a most peaceful and relaxing setting in which to live and study. Claycroft is popular for being near Tesco superstore (open 24/7), and the new Bluebell complex is perfect for Rootes and the Arts Centre. 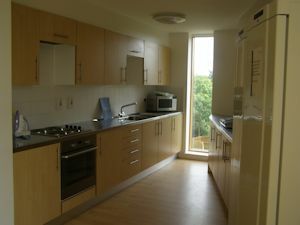 Warwick accommodation is constantly being upgraded and is proud to have such an enviable reputation. All rooms in campus accommodation have in-room Internet access, and many have en suite facilities. Many students also prefer to live off-campus in University-managed houses either near the University in the quiet suburbs of Coventry or in the nearby charming and historic towns of Leamington Spa and Kenilworth. Modern, mostly en suite, accommodation is also available in the centre of Coventry at City Village, Liberty Park and Study Inn..
"Life in Warwick is simply fantastic and never disappointing. Once I stepped on to Warwick Campus, I really fitted into this place in every aspect, with the great environment and wide range of academic facilities from the library to learning grid. First remembrance during the orientation week is just full of fun. Although studying here is extremely different from what I am used to in Thailand, it really gives me the motivation towards my career prospect and develops my learning skill with the high caliber professors from both Warwick Business School and the Department of Economics. I really enjoy the multicultural environment in which people from all over the world get together and there are always endless stories to share among us. Warwick does not only enrich students academically, but also provides the foundation for the career prospect with the exclusive career services and company presentations to ensure the employment opportunities for Warwick graduates." "The University of Warwick is regarded as one of the most prestigious universites here in the UK, with a particularly strong Politics Department. This reputation was a key reason why I was so attracted to studying here. Once term started, my love for Warwick grew because of the friendly culture and immense range of activities. Since Warwick is a campus university, you feel very close to everyone. I have made lifetime friends from all over the world. My advice to those applying to Warwick would be to open up and gain as many experiences as you can whilst you are here. Life here is a truly spectacular journey to fully develop your potential in every aspect possible." "Coming to Warwick is one of the best decisions and experiences in my life. Warwick is more than a university. After a comprehensive class, you can still refresh yourself at the Sports Center, or meet your friends and socialize at the Union. The trips and events organised by the International Office to places such as Oxford and Stratford-Upon-Avon are a great way to spend your weekend. I have also taken part in Host UK, which gave me the opportunity to experience traditional British culture. 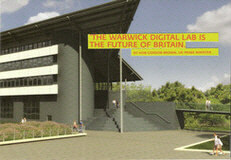 Each year, the University of Warwick provides a range of awards for students from all over the world. I was lucky enough to be awarded the Thailand Postgraduate Scholarship, which is a valuable achievement and has become a great motivation for me to succeed in my academic goal at Warwick. I believe that my year and experience in Warwick will further my future life and career." "Easily put, the three main reasons why I chose the University of Warwick to continue my education: its academic reputation, its campus environment and its international community. Warwick's prestigious Business School has achieved top 5 rankings for some time. I find that the variety of modules available here offers great benefits for students. The diverse groups of staff who come from various parts of the world have also lived up to the high teaching ranking category. I am amazed by the level of diversity at Warick. I have made friends from all over the world, friends whose countries I have visited, and friends who have come to visit me in Thailand during holidays. My advice to you is to take up all the opportunities available to you here in Warwick and experience as much as you can whilst you still have the time. Do not forget to live a balanced life and remember to work hard and play hard"
WMG, an academic department at the University of Warwick, was established by Professor Lord Kumar Bhattacharrya in 1980. It is an international group, with collaborative centres in the UK, India, China, Malaysia, Russia, Singapore and Thailand. Its mission is to improve competitiveness through the application of value adding innovation, new technologies and skills deployment. WMG’s major facilities include the International Manufacturing Centre, the 50-million pound International Digital Laboratory, the Advanced Technology Centre, the CAD/CAM Centre and the 150-million pound National Automotive Innovation Centre (NAIC), which opened in Summer 2018 for research activities through a long-term commitment between Jaguar Land Rover, Tata Motors European Technical Centre, WMG and the University of Warwick. WMG educates the industry leaders of tomorrow through its full-time Master’s and Professional Programmes, which are delivered through our UK and international centres. All WMG tutors are highly qualified with a background in business or industry. WMG master's students have the opportunity to contribute to these and other areas of research through projects. This is a unique chance to be involved with leading-edge research and will give extremely valuable knowledge and experience for the future. The integrated and flexible portfolio of MSc courses are designed to develop skills in management and leadership in technology based industries. They are suitable for students with a wide range of backgrounds and aspirations. The programmes aim to ensure that students engage practically with their studies and are well equipped on graduation to apply this to real work scenarios. Each student takes a minimum of 10 taught modules and major research project. After gaining my first degree in Packaging Technology at Chiang Mai University, I worked in Research and Development for an international cosmetics manufacturer in Thailand. Although I did enjoy my two years there, my role was very technically biased and I realised that to take my career further, I would need to develop my understanding of management and business as a whole. Studying for a higher degree seemed like the obvious next step, so I researched courses in the US and UK to find out which would best suit my particular needs and aspirations. WMG’s Masters programme in International Technology Management really stood out for me. I liked the broad range of subjects, and the fact that the course is designed around managing innovation and technological change in international business. Of course, Warwick’s reputation and high ranking was a big factor too. I also wanted to improve my English language skills and broaden my experience of the world and of people. I had only ever studied and worked in Thailand before, so it was an exciting opportunity to spend a year in the UK and become immersed in a whole new culture. 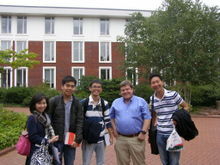 I arrived at Warwick in late summer 2008 and was immediately impressed by the green and very beautiful campus. It’s set away from the city, although still in the heart of the West Midlands manufacturing region. The university is self-contained so everything you need is close by and you feel part of a stimulating academic community. The course itself was as good as I hoped it would be. Each module was fascinating in its own right and I liked the way the programme brought technical and business subjects together into one unified whole. It taught me that to gain a competitive advantage in today’s international environment, companies need to continually focus on their ability to innovate and apply new technologies across both their products and operating processes. It was also extremely challenging. Some areas – like Financial Analysis and Control Systems for example – were brand new to me and I have to admit that I found them quite difficult to grasp at first. But the staff at WMG were great; they were always there to support me through every stage. That didn’t just include helping me with my studies, but how to make the most of living and learning at Warwick University too. For me, the best thing about the programme was that is focused on the application of ideas on a global business scale. As I discovered after I left Warwick, this means that you can apply what you have learned quickly once you’re in the real world of industry. Another good thing was the chance to mix with people from all across the world. This was a great learning experience and I made lots of new friends that I’m still in touch with regularly. While I was in the UK, Ansell Ltd sourced my CV through an online job site and invited me for an interview, before offering me a role in Bangkok as a Packaging Design Executive. After two years there, I was approached by Unilever to join them as Technology Innovation Management and Quality Engineer. What I learned at Warwick definitely helped me gain the job. My all-round knowledge of International Technology Management was exactly what Unilever were looking for and, even after only two months in the role, I’m finding that elements of the course are coming in useful in my day-to-day work: supply chain integration and technology transfer for example. I would definitely say that my MSc has helped me immensely in my career – not only in terms of gaining my positions at Ansell and Unilever, but being able to quickly make an impact on the business too. Just as important for me though, it was a wonderful experience that I will remember for the rest of my life. "There was always support there when I needed it. The teaching staff were excellent and brought each subject I studied to life. I enjoyed the way the course focused on the practical rather than just theoretical. Everything made sense as I could see how subjects related to real world business situations." 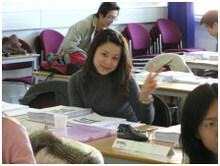 Ploytip Jirasukprasert arrived from Thailand in 2010 to study for her MSc in Engineering Business Management. We asked her to tell us about her experience of her course, life at Warwick and how she created an award-winning research paper from her dissertation project. After gaining her first degree in Industrial Engineering King Mongkut’s Institute of Technology Ladkrabang in Thailand, Ploytip decided to take her education to the next level by studying for an MSc. "To reach my career goals, I realised that I needed a further qualification", she explained. "WMG’s Masters programme seemed perfect for me. I wanted to combine engineering with business, leadership and management. I also needed to improve my English language skills". "I had achieved the highest grade on my BSc course, so I wanted to study with a top university. Many people I spoke to in Thailand recommended WMG and with its high ranking, I felt that a qualification from Warwick would really mean something". When Ploytip began her studies, she soon discovered that one of the most important qualities that a student needs is discipline. "It was quite tough at first", she said. "There is a lot of work to do to tight deadlines. So although you have the freedom to manage your own time, you need to be very disciplined in order to complete it. This reflects the real world though, and I do believe that it’s an important part of the learning process". "There was always support there when I needed it. The teaching staff were excellent and brought each subject I studied to life. Also, I enjoyed the way the course focused on the practical rather than just theoretical. Everything made sense as I could see how subjects related to real world business situations". "It was great fun to work in teams with people from around the world too. Again, this prepares you for the real world of working in international business where you have to interact with different people from different cultures and backgrounds. Being educated from Warwick is not only about studying and getting the degree, but real friendship, enjoyment, happiness have also come together. I could say that it has been one of the most memorable moments in my life." From her dissertation project, Ploytip wrote a research paper entitled: "A Case Study of Defects Reduction in a Rubber Gloves Manufacturing Process by Applying Six Sigma Principles and DMAIC Problem Solving Methodology". "I had a good knowledge of Six Sigma and DMAIC principles, and I could see how they could be applied in this context", explained Ploytip. "The project had a very practical angle as I was working with a factory in Thailand that had a problem with product quality". "The application and results of DMAIC methodology indicated that the correlation between oven temperature and conveyor belt speed contributed to the defects. So then I used a number of quality and statistical tools to obtain optimum values which could be investigated. These helped to bring about a 50% reduction in defects, improving the Sigma level of the process from 2.4 to 2.9". Working with her supervisor, Ploytip submitted her paper to the 3rd International Conference on Industrial Engineering and Operations Management in Turkey where it was presented to an international audience of academics, researchers and industrialists and published in the official proceedings of the conference. Her paper was awarded the Best Track Paper Award in the Lean Six Sigma category. "I was absolutely delighted", she said. "But I do want to thank my supervisor, Dr Jose Arturo Garza-Reyes, for his support at every stage. He was always there with helpful comments and suggestions. I am sure that the paper would not have achieved the award without his valuable help". Dr Garza-Reyes also commented that "The publication and presentation of Ploytip’s project at an international conference and the award it received is just a little example of the high standard work carried out by MSc students at WMG and the support they get from the teaching staff. I am sure that this is an important value added factor that MSc candidates should consider when deciding whether to come to do a Master degree at WMG. After leaving Warwick, Ploytip soon found herself working for a UK company, helping them to launch their products into the Thai market, facilitating trade and providing high-quality customer services". "I am not sure where my career will take me in the future", she concluded. "It is still early days. My time at Warwick really inspired me though – and I know that what I learned there has provided a strong foundation for my future career in international business". Our international reputation means you can be sure there is rigorous research underpinning our teaching. The Association of MBAs (UK). We are one of the largest business schools in Europe, and our academic staff offer a very wide range of specialisms. Our faculty of around 190 academics is of the highest calibre; many are world leaders in their disciplines. In addition to being leading practitioners, around 80 percent of our teaching staff hold a doctorate or higher degree. Each of our courses is different, although some overlap with each other. Some require you to have studied particular fields already, some prepare you for particular careers. If you are confident with numbers, consider one of our finance-based courses: MSc in Accounting &Finance, MSc Finance (ranked by the Financial Times as top pure finance course in the UK and in the World Top 15), MSc Finance &Economics or MSc Behavioural Finance. If you’re interested in management, but haven’t got any undergraduate business education, you might consider our MSc in Management (ranked 1st in the UK by the Financial Times for graduate employment). There is also MSc in Business, which has 4 pathways: Consulting, Finance &Accounting, Leadership, and Marketing. If you’re interested in people and ideas, have a look at our MSc Human Resource Management &Employment Relations. If you’ve already studied some business, then why not branch out into a specific field with our MSc in Information Systems Management &Innovation, or our MSc in Marketing &Strategy? If you are interested in finding ways to improve decision-making, or solve practical problems in organisations, then consider our MSc in Business Analytics. The Warwick MBA has an outstanding international reputation, ranked by the Financial Times within the top ten UK programmes. Our Distance Learning MBA is ranked first in the UK and offers a flexible, part-time route to achieving this prestigious qualification.